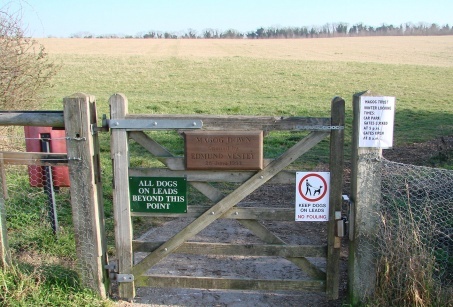 In response to the popularity of Fair Field by visitors wishing to exercise their dogs off-lead, a second designated off-lead Dog Exercising Area has been sectioned off and opened up. 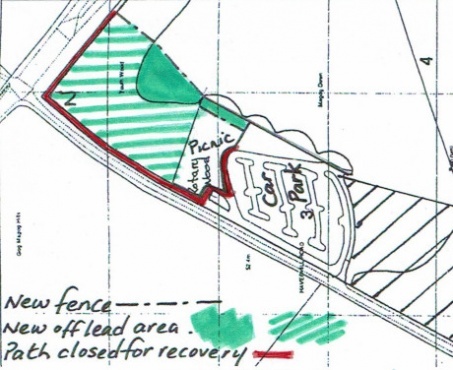 Access to the new area is shown on the map detail (see below): a new path has been created alongside the existing Picnic Area, before the gate going on to North Down, and this emerges into the new field which has now been fenced off from North Down. A short section of the familar Perimeter Path at this corner of the site has now been closed off temporarily for recovery; the route to the remainder of the Perimeter Path is currently through the new Exercising Area. After a period of recovery, the closed section of Perimeter Path will be re-opened. All dog walkers visiting Magog Down are reminded that the whole site remains an On-Lead area AT ALL TIMES except where off-lead walking is clearly indicated on signage - or in the case of Colin's Paddock, No Dogs. Please respect these special rules! 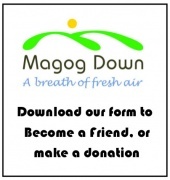 Thank you to the majority who do respect this rule, you help to make the very unique and special Magog Down a pleasant haven for all to enjoy. Visitors are also reminded that our fences can never be guaranteed to be "dog-proof", so these off-lead areas are not suitable for training of dogs who have not yet learned recall reliably. So as always, even in the off-lead areas, you must keep your dog on a lead if you cannot rely on its obedience. Follow the Countryside Code - keep your dog under control at all times. 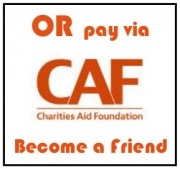 Reminders aside, we hope that our visitors make good use of this new exercise area, and we welcome any donations towards its installation and upkeep, either in the form of donations or Friend of Magog Down applications. The entrance to North Down: clearly signposted for Dogs to be On-Lead. This rule applies at all times of the year, to every dog, however well-behaved it may be! With 2.5 miles of off-lead perimeter path available, and now two different off-lead grassy areas for exercising, there can be no excuse for not popping your dog on its lead should you wish to visit or pass through the North Down. Voting will take place from Tuesday 2nd January 2018 to Wednesday 28th February 2018.